We can see Venus pass in front of the sun once every one hundred and twenty years. Ever since it's been observed, a strange thing has been happening. Instead of appearing as a dark circle moving across the sun, Venus formed a tear drop shape that slowly oozed onto the solar disc. It took three hundred years for scientists to understand the Black Drop Effect. In 1769, James Cook was in Tahiti, trying his best to set up telescopes. His trip over was partially sponsored by the Royal Academy, for no lesser purpose than laying out the solar system itself. People knew, roughly, the order of the known planets, but they had no way to know the actual mileage involved. How far were the planets from the sun? One way of finding out was taking a look at how fast a planet crossed a known distance, like how fast Venus moved from on side of the sun to the other. The problem was, a 'transit of Venus,' when Venus passes between the sun and the earth, happened rarely. An eight year period saw two of them, and then there were no more for another 120 years. The astronomers needed to make the most of their chances. Cook observed the transit, and made a drawing of it in his journal. Oddly, the journal showed not a black circle passing in front of a bright one, but a transit that looked like a drop of water falling from a surface. The black spot had a wide base for too long a time, as if it were water coalescing into a drop. Then it tapered off into a tail, and broke free, moving as a circle across the sun. This has been observed regularly since then. The Black Drop Effect has puzzled astronomers for centuries, and only recently have two astronomers figured it out. One of the main candidates for the cause of the effect was Venus' famous hazy atmosphere. Astronomers could have been seeing the gas around Venus from the wrong angle, making it look opaque. Earth's own atmosphere was also considered a problem. It could blur the image and make the dark section look larger. In 1999, Jay M. Pasachoff and Glenn Schneider at Williams College took a look at the transit of Mercury, which has no atmosphere. The camera they used was on NASA's Transition Region and Coronal Explorer, comfortably outside of Earth's atmosphere. The spacecraft recorded the transit of Mercury, and the Black Drop Effect that accompanied it. Clearly nearly Venus's nor Earth's atmosphere was the problem. The problem was the Sun's atmosphere - or rather the gas that the sun exudes. Most people will have noticed that when they look into the fog, certain angles are clear while other angles seem more opaque. Gas (or water vapor), when looked at from a steep angle, lets less and less light through. This is because you're looking through more and more gas. The swirling clouds around the sun do block light, and as we look at the edge of the sun, we see a cross-section of more gas. On top of that, no matter how good the instruments, there is always going to be some lack of resolution. Even excellent telescopes will fill in a little darkness between surfaces that get sufficiently close to each other. The two conditions combine to make the movement of planets across the sun look like falling drops of black rain. If only all limitations were that poetic. 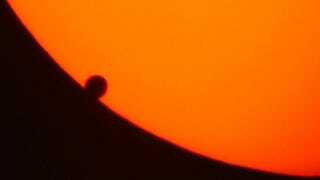 Via Transit of Venus.org, and NASA.